Since the future of the congregation depends on the quality of the members, proper formation and effective training of the members are the primary importance. Formation enables the candidates to be the true disciple of Jesus in the Eucharist and to offer themselves a pleasing sacrifice to the Heavenly Father, to offer as atonement for the sins of the world, and to be set apart for the service of the Church. In the footsteps of my master gives the directives of SABS formation. "He chose us in Christ, before the foundation of the world to be holy and blameless before him in love"(Eph.1/4). Aspirancy for one year helps the candidates to attain human and Christian maturity and to discern one's call to religious life. They learn how to live in the community with others who come from different backgrounds. Both the formator and the candidates get the opportunity to study the intellectual ability mental and emotional maturity, value system, physical help, and purity of intention and to understand the aptitude of the aspirants to live a Eucharistic life. After the aspirancy period, candidates are sent for +2 course. At present there are 3 pre-aspirants and 6 student aspirants in the province. The candidates spend one month in preparation before entering postulancy. This is the period of immediate preparation for the novitiate. They become deeply aware of the need to free themselves from all worldly attachments in order to consecrate their lives to God. They grow in Eucharistic devotion and grow deeply rooted in the SABS charism. 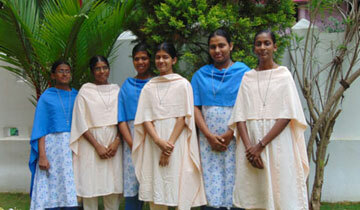 St. John's Adoration Convent Nenmanikkara is the postulants' house and there are four postulants under formation. "I will allure her, and bring into the wilderness and speak tenderly to her" (Hos.2/14). Novitiate is the most important stage of formation. The goal of the novitiate is to prepare the novice to enter into the covenantal relationship with the Eucharistic Lord, learning from Him meekness, humility and infinite love. They find joy and fulfilment in being transformed into a perpetual adorer by remaining with the Eucharistic Lord. They are given opportunities to practise asceticism personally and in community. After one year canonical novitiate, the novices spend one more year to deepen their intimacy with Jesus so that they can totally surrender themselves to the Eucharistic Lord. Sacred Heart Convent at Padavarad is the novitiate house and there are 6 novices in the canonical year. Juniorate is a period between the first profession and the perpetual profession. Deepening in the religious commitment and growing in personal maturity, they prepare themselves for the perpetual profession. The duration of the juniorate is 6 to 9 years. 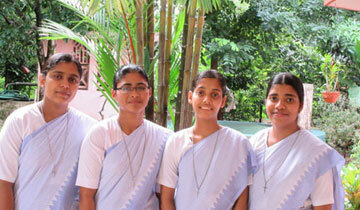 During this period junior sisters are sent for secular studies that can be the basis for their future apostolate. 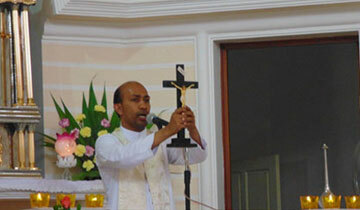 They are also given opportunity for parish ministry, campus ministry etc. 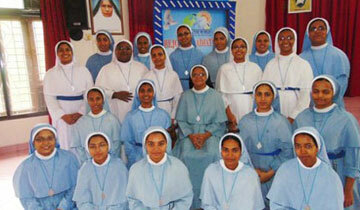 The province is blessed with 25 junior sisters at present. The goal of on-going formation is continual renewal of one's religious life by remaining faithful to the charism of the congregation. As St. Paul reminds, "Do not be conformed we to this world, but be transformed by the renewing of your minds, so that you may discern what is the will of God- What is good and acceptable and perfect" (Rom. 12:2). On-going formation deepens the covenantal relationship and helps to accept our life experiences as indispensable part of religious formation. Every day we learn to start a afresh from Christ and from His death and resurrection. The responsibility for on-going formation rests upon each individual. We are obliged to safeguard the vitality and spirit of our charism by co-operating with all the renewal programme of the congregation. The General synaxis has envisaged certain programmes for on-going formation such as cloister, forty days retreat, decennial programme, 52 days retreat, annual retreat, monthly recollection, yearly prayer days etc. Many of our sisters have participated in any one of the above renewal programmes .The province arranged retreats for all the sisters at Sehion retreat centre Attapady, along with follow up programmes, in addition to the annual retreat in the Province .For the super senior sisters three days Spiritual enrichment programme was arranged in the Provincial house. Under the guidance of the PRT every second Saturday monthly recollection is conducted in all the communities in the Province. Sisters are divided into different batches for 5 days prayer programme conducted at the Provincial House. They are given classes on prayer life, vowed life and community life. The houses in the province taken as a unit, has divided the hours of the week for adoration day and night. 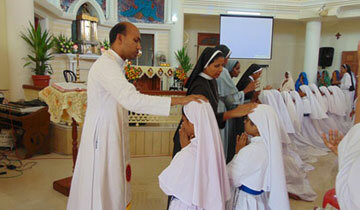 Besides all these, sisters are given classes on Bible, Encyclicals, Apostolic Exhortations and other Church documents.